Can generate 8,500 to 42,500 BTUs and heat up to 2,000 sq. ft.
A decorative log set can be added to the appliance to enhance the look of the firebox. A decorative trivet can be installed in place of the standard model for additional detail. Outside air kits provide combustion air from outside the building envelope, increasing efficiency and ensuring proper fireplace operation. Dimensions: 5' L x 2" Dia. This 4 Inch Female to 3 Inch Female Chimney Liner Adaptor is designed for use with four-inch HomeSaver UltraPro chimney liner systems. Tee section designed for 4-in. UltraPro chimney liner pipe. This tee section has a 3-in. take-off. The 4 inch x 25-ft. HomeSaver UltraPro 316Ti Chimney Re-Liner Pipe is a direct reflection of HomeSaver UltraPro's custom machining and superior engineering. HomeSaver UltraPro chimney liners begin with .005-in. thick 316Ti stainless steel which is then vertically corrugated by high-tech machines. A patented roll-lock seam is applied that yields greater strength and increased flexibility compared to more traditional or generic chimney liner pipes. HomeSaver UltraPro pipes are easy to work with, more reliable, and have a greater crush strength than similar pipes of even greater thickness. Homeowners and chimney professionals alike will agree that the 4 inch x 25-ft. HomeSaver UltraPro 316Ti Chimney Re-Liner Pipe is the safest, most convenient, and most effective reliner of its kind on the market. The 4 Inch x 35 Foot HomeSaver UltraPro 316Ti Re-Liner Pipe is a direct reflection of HomeSaver UltraPro's custom machining and superior engineering. HomeSaver UltraPro chimney liners begin with .005-in. thick 316Ti stainless steel which is then vertically corrugated by high-tech machines. A patented roll-lock seam is applied that yields greater strength and increased flexibility compared to more traditional or generic chimney liner pipes. HomeSaver UltraPro pipes are easy to work with, more reliable, and have a greater crush strength than similar pipes of even greater thickness. Homeowners and chimney professionals alike will agree that the 4 Inch x 35 Foot HomeSaver UltraPro 316Ti Re-Liner Pipe is the safest, most convenient, and most effective reliner of its kind on the market. This collar plate is designed to fit the HomeSaver 4" Pro/Ultra Pro chimney liner systems. It is made with 316-Ti alloy that can withstand even very harsh conditions. The collar plate provides the top support for the whole UltraPro installation because it has the top, storm collar, and top clamp all in one piece. The clamp can be tightened with just a screwdriver to create a welded watertight seal. The dimensions of the item are 13" x 13". Installing the proper weather protection when terminating your vent line is important for the longevity and efficiency of the entire system. This collar plate saves you time and money by combining the top plate, storm collar, and top clamp all into one piece. This durable titanium alloy collar plate supports the entire UltraPro chimney liner installation. A built-in clamp fastens the whole collar plate firmly in place with only the use of a screw driver. The welded seal is watertight to effectively protect your liner pipe from weather damage. Choose this collar plate to terminate your 4-inch chimney liner pipe system. Every chimney vent needs protection from the elements, and this rain cap is designed for use with the 4" UltraPro chimney liner system. The solid cap keep out rain and snow while the 3/4" mesh excludes animals while allowing the smoke to exit. This part fits onto the separately purchased collar plate with the attached band connection. The rain cap is available in sizes from 3" to 8" that match the other of UltraPro liner. Meet the UL1777 requirements for both masonry chimneys and wood burning appliances by using this stainless steel chimney liner manufactured by DuraFlex. Designed to be used in tandem with the DuraVent DuraFlex Zero Clearance Insulation Sleeve, this liner protects the masonry chimney from any negative effects due to flue condensation and promises safe and efficient venting for a variety of heating appliances including gas, wood pellet, oil or wood. With a limited lifetime warranty, this DuraFlex stainless steel chimney liner is a win-win solution! DuraFlex SS is a flexible chimney liner used to reline masonry chimneys and is rated for use with gas, wood pellet, oil, or wood appliances that include water heaters, boilers, furnaces, and fireplace inserts. It uses a single wall 0.006" thickness that makes it stronger than other light liners. DuraFlex SS is the most economical liner for a straight chimney. This item gives you 20 feet of 4" liner. It should be used with the DuraFlex Zero Clearance Insulation Sleeve so that the UL 1777 standard for masonry chimneys and wood burning appliances is met. DuraFlex's stainless steel chimney liner is perfect for straight chimneys. This liner protects masonry chimneys from the material that tends to threaten to corrode it when used with heating appliances and fireplaces. The liner can be used with wood burning, wood pellet, and non-condensing gas, coal, and oil appliances. It is 4-inches around and 25-feet long. It is not very heavy, so that should make for easy installation of the liner. The manufacturer offers a limited lifetime warranty on this liner. DuraFlex offers a safe and efficient venting of heating appliances while protecting your chimney from the harmful effects due to flue product condensation. The 304 SS and 316 Ti SS (Cap is approximately: 16" L x 16" W x 4" H) are both designed to be used with the DuraVent Dura-Vent Two-Ply Insulation Sleeve for use of burning wood, wood pellet, non-condensing gas, coal, and oil appliances. Choose a safe and efficient venting option for your home when you select a DuraFlex design for your home chimney liner. Not comfortable with storing flammable propane or natural gas in your home? Don't want to deal with the hassle of starting and maintaining a wood fire? Don't worry, you can still enjoy the warmth and atmosphere of a roaring fire with a Napoleon NPI45 Black Pellet Burning Fireplace Insert. The pellets used by this insert are capable of producing the same enticing flames as other fuels, yet are easy to store and free of the safety hazards associated with gas. In terms of performance, this pellet insert is the equal of any gas or wood-burning insert. A reliable automatic lighter provides you with a quick start-up every time and the advanced burner system ensures an efficient burn. You'll also appreciate this fireplace insert's convenient design features like an effective glass air wash system and automatic purge cycle for stress-free maintenance. This pellet insert even has a four-stage FAILSAFE system to keep your family and guests as safe as possible. 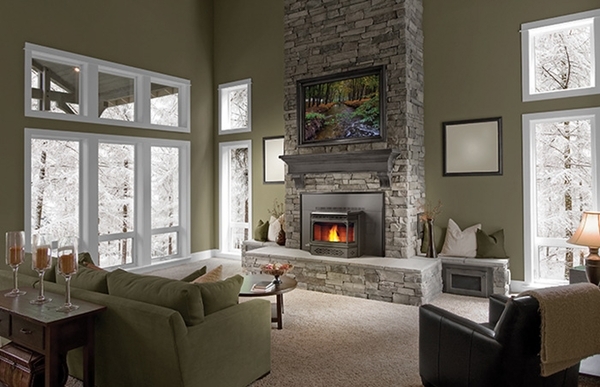 Because it's a Napoleon product you're probably not surprised that the NPI45 Black Pellet Burning Fireplace Insert can be an excellent additional heat source for any part of your home. But did you know that this pellet insert can also enhance your home's appearance? With simple lines and concealed controls, this insert instantly brings rustic charm to any location. And you have the option of customizing it with decorative doors and panels. So why not make the most of your home with this efficient and eye-catching home accessory? *Note* - A decorative flashing must be selected from the accessory tab to complete the unit. Can this be direct vented through an exterior wall, or must it be vented up a chimney? While the free standing stove version of this unit can indeed be vented horizontally through a wall, the design of the insert necessitates that it be vented vertically through the existing chimney. Will this unit continue to heat my space if there is a power outage? Unfortunately, no. Pellet stoves and inserts require 120 volts to operate. As such, a backup generator or battery supply would be needed for the unit to continue operating. Does this unit come with the surround and a log insert? You cannot install logs in this unit as it is a pellet burning stove. You can only burn pellets in it. What is the efficiency rating of this insert? This particular unit has an overall efficiency rating of 75.4%, per Napoleon. Our Pellet Fireplace Insert was installed about 2 weeks ago. We have enjoyed the stove several nights since. ProsEasy to use, just hot the on/off and it powers. Do the same to turn it off. Great Stove. ConsAs far as comments, you feel Nickle-Dimmed , for instance, the door is $ 575.oo when purchasing the Insert. By time you get it to your home, Chimney Sweep and Install you find yourself spending an extra $ 1,300.00 and you haven't even the fire log yet. I always wanted what I have, just someone is making a killing. My wife and I purchased this product and I was a little skeptical at first because many sales people at fireplace shops in the area were pushing their overpriced pellet stoves and downing Napoleon. I am so happy we went with the Napoleon pellet insert. We have oil heal and we are already seeing the savings.....the blower is a little noisy on high, but our chimney guy said it's normal of all manufacturers.